I have been told of the death of John Dixon of Aussteiger Publications, known to many as Lowergate. He was a truly great friend to me, always so kind and thoughtful. I enjoyed his company on the recent walks around Downham and Castercliff hillfort. He had a vast knowledge of prehistoric sites across the north-west of England, in particular the Pendle and Clitheroe areas. His many books are awesome to read with many, often unknown sites pointed out in the Brigantia series of walking books. John you WILL be so sadly missed by myself and many, many others in this field. Thank you John for all your help. When we walk upon the hills and moors of Pendle and Bowland, John you will be walking with us in spirit and guiding us along wherever we may walk. John, now you can find rest and peace. R.I.P John Dixon, a true gentleman. 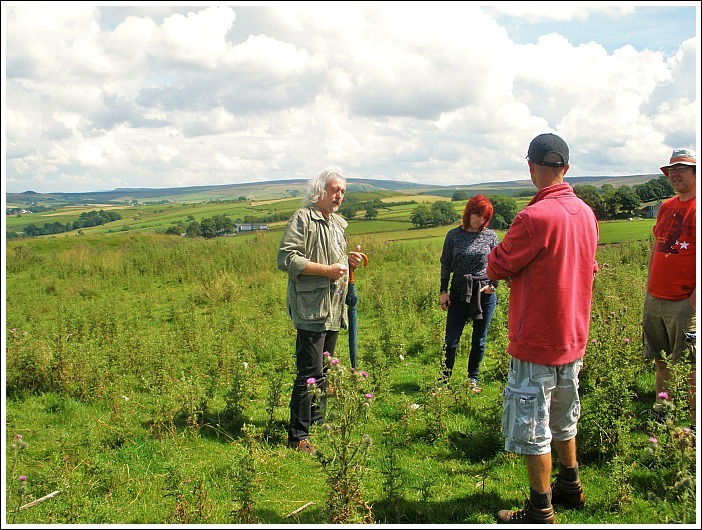 The late John Dixon, known to many as Lowergate, seen here on Castercliffe Iron-Age hill-fort, near Nelson, Lancashire, explaining the history of the site on 4th August 2012. Categories: Misc Subjects | Permalink.